There’s plenty of gutsy dressing in this salad so serve with bread to mop up all the tasty juices. Or add another can of beans and make it go further. A good dish for a picnic or work lunch, or to go with meats or vegetables. 2 Mix extra virgin olive oil, lemon juice, mustard, garlic, parsley and ½ tsp of salt and plenty of black pepper in a large bowl. Add the beans and toss well. 3 Slice tomatoes in half and leave to drain for 5 minutes. 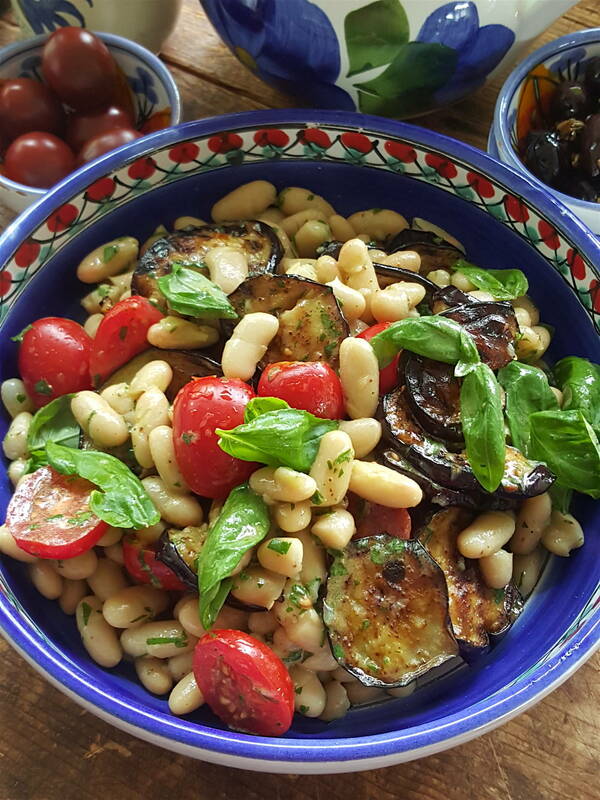 Gently stir the tomatoes, eggplant and basil leaves through the bean salad. Serve immediately. How to cook an eggplant to perfection is a mystery to many cooks. Too much oil and they will be heavy and sodden, insufficient oil and the result is dry and rubbery. Get it right and they are utterly delicious with crisp-edged skin and meltingly tender, creamy flesh. My method for fried or barbecued eggplant slices is to brush each slice with oil using a thick brush, or to quickly dunk the slices in oil, letting the excess drip off. What you want is an all-over oily coating, but not for the eggplant to be saturated. Cook in a hot ridged grill pan, or on a heated barbecue hot plate, until they sizzle to a deep golden brown. They must be cooked right through, or they’ll taste astringent and bitter. If they look dry as they cook, brush or *spray with a little more oil. Transfer to a plate and season with sea salt while they are hot. Cooked eggplant can be kept refrigerated for 2–3 days and used in pasta dishes, on bruschetta, in salads with burghul or couscous, or with lamb dishes. There is no need to salt modern varieties of eggplant before cooking because the bitterness has been bred out; however, if you grow them yourself every so often you will come across a bitter one. How do you tell? It smells strongly of green capsicum and may have a detectable green ring just under the skin. Slice it, salt it and drain in a colander for 30 minutes, then pat dry before using. *If you are using an oil spray, check that it has nothing but oil in it. There will most likely be a propellant and chemicals to stop the oil from clogging the nozzle. A bottle that is recyclable and a brush that lasts for years is kinder on the planet than a spray can of oil. You can make your own product with olive oil and a pump (spray) bottle (bottles are available online). *Furthermore, use olive oil. Olive oil and avocado oil are the only two oils produced simply by crushing fruit. You may have seen pictures of oil growers and producers gathered around olive oil crushing machines dunking bread into a jug of just-crushed olive oil, or holding bread under a flowing tap of oil as it comes out of the crusher (it smells and tastes divine, by the way). You can’t do that with any other oil (apart from avocado oil). ALL OTHER OILS ARE PROCESSED. Helpful tips as always. I’ve used a variation of dijon and olive oil for years most often on white beans and tuna for salads. Now I’ll use it with eggplant. Yum. Problem is which of the many eggplant recipes ala Julie do I make with the one in the frig. Thank you . And thanks for each generous post, way more than a recipe.